There was a new cafe in Vancouver, Canada and the owner, Chef Yamato Takahashi a nouveau entrepreneur originally from Japan requested me to help him promote his restaurant. In order for me to do so intelligently, I have to taste the food. One of the dishes that piqued my interest was the Japanese version of the spaghetti called Naporitan or Napolitan. Story had it that after World War II a hotel chef in Yokohama, Shigetada Irie, created the dish because the two main ingredients available to the American soldiers were spaghetti and tomato catsup. The dish was named after the city of Naples or Napoli, although the recipe is unknown in Italy. Because there is no L sound in Japanese the pasta is pronounced Naporitan although it has both r and l spellings.. In I Tbsp of canola oil plus1 Tbsp of residual oil (oil used to fry chicken rolled in flour, sprinkled with salt and pepper), fry penny-size pieces of regular ham. Shred or julienne 2 button mushrooms, 1/5 of a small white onion, 1/5 bell pepper (red and yellow) and an inch of a thin carrot. 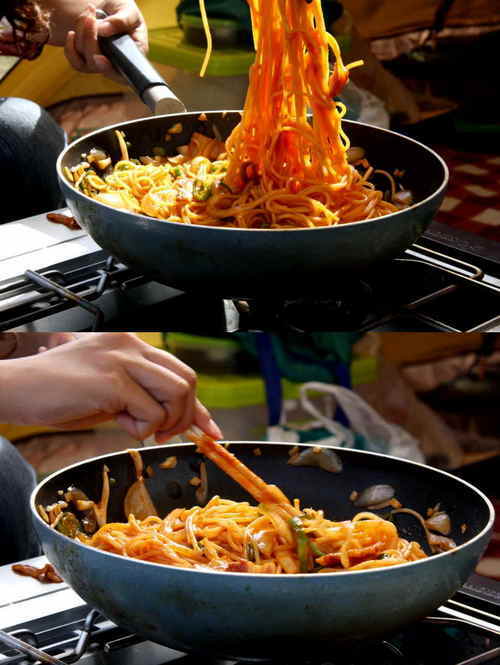 Drop al dente spaghetti pasta (strained of course) into the cooking pan of ham, catsup, veggies, etc. Stir and swirl for a couple of minutes till pasta is totally painted with the sauce. Good news! The press release - copies of which were distributed in surrounding neighborhoods - is generating new customers for Café L’Orangerie.